I wasn't sure if this went in Roving and Wool or Extended Dreadlocks, so if this is in the wrong place, feel free to move it. 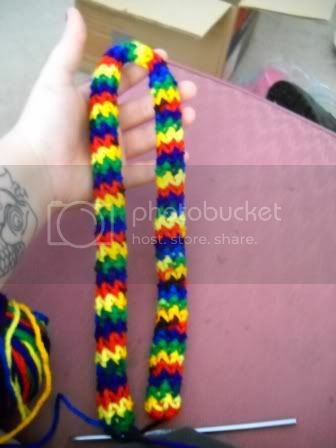 Please have *some* experience with crocheting before attempting, or at least know what a chain, single crochet and a round are. 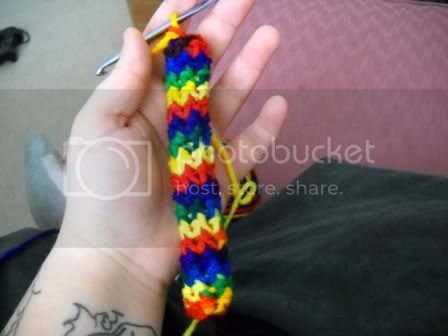 There are wonderful tutorials on youtube to teach crochet. If you are familiar with amigurumis, this should be a breeze. Rnd 1: Ch2, sc 6 in first ch, place marker (safety pins and bobby pins work great). I didn't count my rounds, so the markers aren't in the photos. Rnd 2: Including marked ch, count back 6 chains to find first ch. Sc in first ch. This makes the project round like a tube. Sc in each ch including the one with the marker. Move the marker up to the st you just made. This completes a full round. If you want, you can count your rounds to ensure your dread is the same length on both sides, or you can eyeball it. If you don't want to count your rounds, just keep doing sc in each chain until you get the desired length of dread. Or, you can keep track of how many rounds you do moving your marker up with each completed round. Either way, make sure your work looks similar to the pictures. After you've done a few rounds, you should have a little finger hat going on, like in the pic. 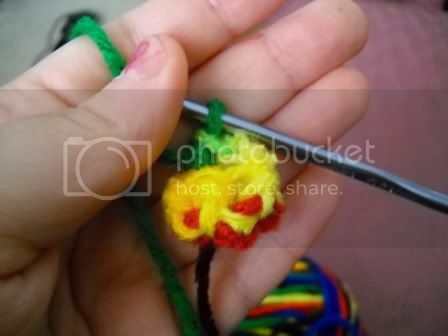 Counting rounds or not, just keep doing single crochets and you will gradually have a tube going on. Once your tube is about 2" or 5cm, you can start stuffing with fiber fill. The fiber fill is optional. The dread will look great with or without it, the fill just gives the dread a little mouldability. Keep in mind this also makes the dreads much heavier. 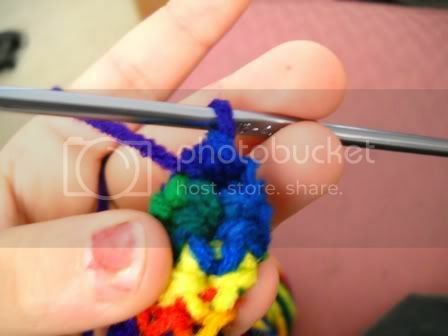 As your dread gets longer, you may need to use your crochet hook to pull the fiber fill into the dread. 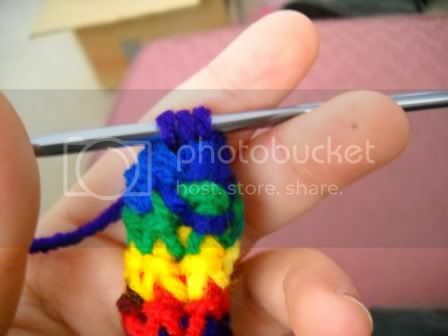 You can also use the hook to tug lumpy spots smooth. 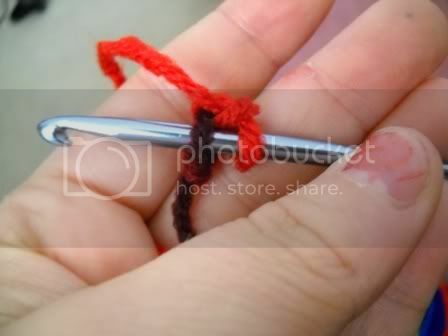 When doing this, don’t try to pull your hook back out because fiber fill will come with it. Stick it through the other side of the dread and pull it out that way. Eventually, you will reach the length you desire for your dread. If you are using fiberfill, make sure the dread is stuffed well to this point. (How to Sc2tog) Insert hook into ch, draw up loop. Insert hook into next ch, draw up loop. There should now be 3 loops on your hook. Draw yarn through all 3 loops. 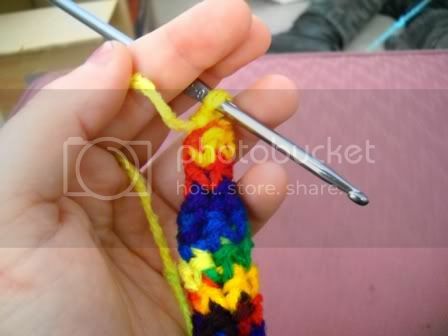 That’s how to single crochet 2 together (sc2tog). Sc2tog, sc, sc2tog, sc. Your tube is now 4 sts around instead of 6. Sc around until you have a skinny tube 2-3” or 5-8cm long. DO NOT STUFF THIS PART! Now to make the other side of the dread…. Sc 2 in the same ch, sc in next ch, sc 2 in the same ch, sc in next ch. Your tube is back up to 6 sts around. 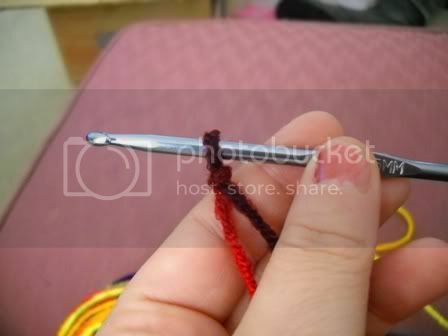 (If using fiber fill) Sc around for a few rounds, then pinch the skinny tube right above the widening. Stuff firmly. Continue sc around until desired length is reached, stuffing along the way if fiber filling. To finish off, (stuff end super tight), then sc2tog, sc2tog, sc2tog, secure knot and bind. Use your crochet hook to fluff inner filling to the end, then YAY! 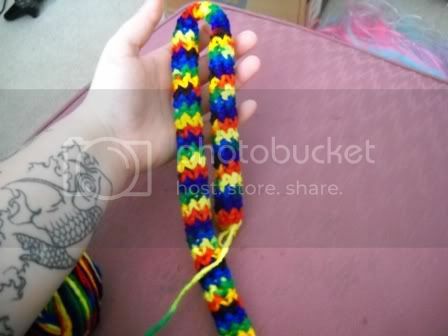 You have a completed crocheted double ended dreadlock! Last edited by brandalynn on Mon Jan 18, 2010 3:16 pm, edited 2 times in total. However, you may want to update your images with ones less blurry. The macro setting on cameras allow you to take images of things close up without distorting the object and focusing on the background. Sorry about the quality of the pics, everyone. I have a *p.o.s. * webcam that I can't upgrade from until Feb. I do love this technique though, so fresh and innovative!! Better pics have been posted, if anyone needs help or more explanation, let me know. I love using the lionbrand homespun and velvetspun yarns, but the dreads come out friggin' huge. SUPER soft and lots of fun. After taxes, I am hoping to get pics of different types of yarn. If anyone else tackles this project, please post pics for everyone! 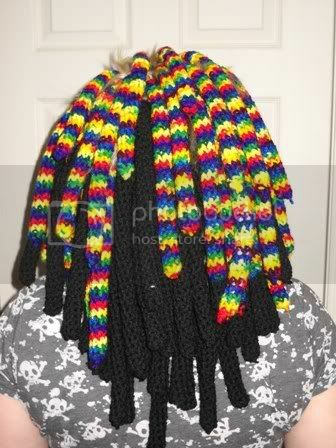 I learnt how to crochet recently and your crochet dreads look like they would be quite fun to make. 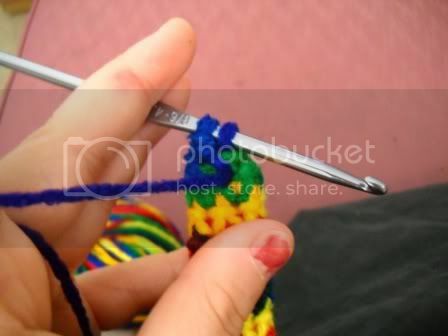 Have you looked at other crochet and knitting techniques for doing toys and dolls hair? I bet you could find sme interesting techniques. Thanx I'm still a novice at knitting. 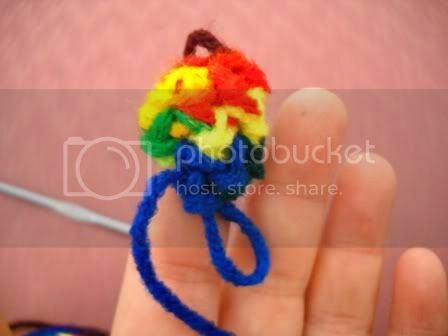 I figured this out while making an elephant trunk on an amigurumi. I'm always looking for new ways to tinker with dreads and hair stuff. I am currently experimenting with legos as dread accents. and I've also noticed that some Octopus crochet dolls have curly tenacles; I haven't found a video for this but I've found one for a scarf which looks the same. Hope these give you some ideas. I may try the curly one myself. Definitely want to try this out sometime. Pictures are looooooads better and easy to follow. Thanx for the links. That's a cute scarf. I've used the curly cues to make arms and legs for a clown doll, but never thought of making them curly dreads! The octopus you're talking about is probably an amigurumi. They are soooooo cute and fun to make. 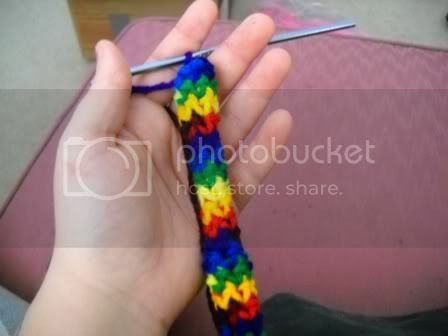 There are all sorts of amigurumi patterns at www.lionbrand.com and they're free. Here's a link to the octopus. I'm glad the pics are easier to follow. If anyone makes a set of these, please post pics for everyone!